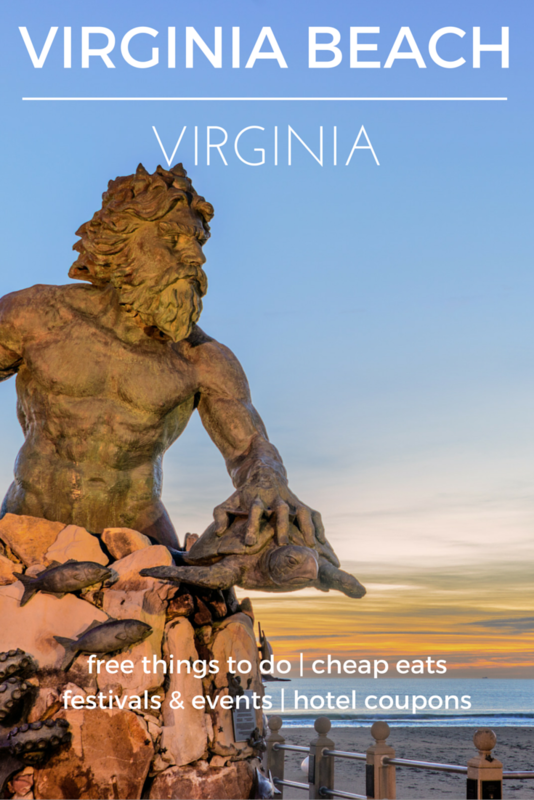 Virginia Beach is an ideal vacation destination year-round! It’s not just about the beaches – this town offers great opportunities for museum lovers, outdoor adventurers, families and more. Whether you’re looking to go fishing, shopping, hiking, exploring or playing, you’ll love exciting Virginia Beach, Virginia. From bustling tourist beaches to the bay-coast sands, there are more than 35 miles of shoreline in Virginia Beach. There are a variety of free public beaches to choose from, so you’ll have no problem fitting the sun, surf and sand into your budget. Historians and bird-watchers alike should plan to visit the Atlantic Wildfowl Heritage Museum. Here you’ll find handcrafted decoys of waterfowl native to the area. The best way to experience Virginia Beach is to take the Boardwalk walking tour! This stroll along the Atlantic Coast will take you to many of the popular attractions in Virginia Beach. The Virginia Legends Walk is a must-see in Virginia Beach. Right along the Atlantic Avenue, you’ll find plaques dedicated to famous Virginians who have made a major impact on history, including Ella Fitzgerald, Robert E. Lee, George Washington, and more. This park off 31st street along the boardwalk offers ocean views and a 34-foot statue of King Neptune. This is the perfect place to play with the kids, have a beachfront picnic, or attend an event. Explore the oceanfront park that marks the historic first landing place of the Jamestown settlers. Entrance to the park is free, but you can pay for guided walking tours or admission to the Cape Henry Lighthouse. Entrance to the refuge is free November – March, but a $5 fee is required the rest of the year. Visitors can enjoy wildlife watching and photography, boating on small vessels like canoes and kayaks, and walking the refuge’s trails. If you’re looking for a multi-purpose park with plenty of space for outdoor activities like sporting matches, walking and running, picnicking, and more, City Park is your destination. This 43-acre city park is located on Kempsville Road. Drive to one of the many nearby observation parks close to Oceana Naval Air Station. Whether you’re planning a romantic evening or a fun family activity, watching these impressive airships will have you in awe. Although admission is not typically free, the Planetarium offers monthly scheduled presentations free of charge. Explore the universe beyond by attending one of these free events at the Virginia Beach Planetarium. Take an incredible boat trip off the coast of Virginia Beach to go whale watching with Winter Wildlife Boat Trips. Seeing these impressive creatures in the wild with amaze you. Join the festivities in support of Special Olympics Virginia. Activities include a plunge into the cold Atlantic Ocean, beach volleyball, 5k races, costume contests and more. This celebration of the performing arts brings world-class artists, musicians, dancers, actors and more to Virgina Beach. Make time to see a performance this year. Enjoy a unique day at Portsmouth City Park, featuring large kites, professional kite performances, family activities and much more. Each spring the PANorama Caribbean Music Fest brings the sounds and soul of the Caribbean to Virginia Beach. Enjoy the sounds of a steal drum band and more along the waterfront. From concerts on the sand to classic cars on the boardwalk, this three-day music festival will kick-off your summer. Some of the greatest popular musicians of all time have headlined at the American Music Festival in Virginia Beach. Don’t miss this three-day musical event on the beach. This two-day concert series features the blues artists you know and love along with up-and-comers. Blues on the beach – what else could you need? The Virginia Beach waterfront offers a taste of the Mediterranean, with Festa Italiana and My Big Fat Greek Party. Enjoy food, beverages, live entertainment and more. More than 30 breweries participate in Virginia Beach’s weekend beer festival. Head over to 24th Street Park for samples, entertainment and more. It wouldn’t be the holidays in Virginia Beach without the impressive McDonald’s Holiday Lights at the Beach display. Discover sea-themed lights, Christmas lights, and so much more. Adults and kids alike will be enchanted by this oceanfront display. This Virginia Beach tradition features performers, marching bands, balloons, gloats and other festive attractions. Get in the holiday spirit with this oceanfront parade.